Is the party about to end in Brazil? FORTUNE -- Marcelo do Rio stands outside his new Brazilian pizzeria, grinning. The sale of his brewpub chain financed the launch of his new business -- and the purchase of his swank Rio home. This Brazilian's success story is but one in millions. "Brazil is like the US in the 1950s," beams do Rio, who plans two more pizzerias, a dough factory and selling his secret sauce in stores. "It's a great time to be here." It is indeed. Last year, Brazil's bourse soared 83% and in May, its stocks comprised an astounding one-sixth of emerging markets portfolios. In February, new Sao Paulo apartment sales surged 84% year-on-year; vehicle purchases rose 30% a month later. And as Greece imploded, Brazil's economy grew at a torrid 9% pace. What fueled this boom? Seven years of soaring soy and steel exports to China, which sparked a virtuous circle of new manufacturing jobs, retail businesses and brisk home sales on flush credit by Brazil's growing middle class. But unlike prior upticks, this one has had staying power for this massive country of 192 million. Prudent fiscal policies under union leader-turned-president Luiz Inácio Lula da Silva helped tame Brazil's sky-high inflation, interest rates and a wildly fluctuating currency. But there are signs that winds could shift, despite the fact that the country is beginning to prepare for its moment in the global spotlight with the 2016 Olympics. Behind the euphoria, seasoned investors are starting to squirm. Interest rates and inflation -- now at 10.75% and 4.8%, respectively -- are beginning to creep up. Skeptics worry that Brazil's China-like growth could cause bottlenecks as capacity struggles to keep up with demand, investment falls, and public spending continues to rise. Investors particularly fret over Brazil's failure to enact reforms like looser tax laws that would shore up tepid growth and domestic spending in the event of a major downturn. Throw in uncertainty about a new president come October, a strong currency, and a Chinese pullback on commodity buys, and many investors who rode Brazil's bull market are mulling a move elsewhere. Brazilian stocks already shed 11% in the first half of this year. Alan Nesbit, portfolio manager at First State Investments who recently pruned his Brazilian holdings, thinks the market ran more on momentum than fundamentals. "I worry about unsophisticated investors heavily exposed to Brazil," he says. Already, steel prices are falling as China tightens lending to cool a building boom. And the dragon is pegged to buy 31% less soy abroad in August. Sluggish growth in Europe, Brazil's top export market, is also worrisome. There's concern that jobs may suffer if exports slip and consumer spending -- which comprises 63% of Brazil's economy -- slows. And though big bucks flowed into stocks, other long-term investments still wane. Foreign investment inflows of $26 billion in 2009 were down 42% from 2008's $45 billion -- a steeper than global average fall, according to UN investment tracking agency UNCTAD. Foreign investment in Brazil as a percentage of GDP has been low, at roughly 26% last year versus 37% for the region. "Brazil will run out of fuel," worries Mauricio Rosal, an economist for Raymond James there. "Our 15% savings rate is insufficient. We need capital or reforms to boost productivity." Long-term investors are shying away from Brazil because of its high taxes and state involvement in some sectors, which changed little with Lula. Pension reform awaits. That's worrisome because spending on state salaries doubled from 2003 to 2009, rather than flowing into the better roads and schools Brazilians need. Others point to Brazil's interest in making waves on the global stage instead of on efforts to prepare its own economy for slower growth as reason for worry. Lula has meddled more in sectors including energy and is throwing his weight behind controversial causes like Iranian nuclear. 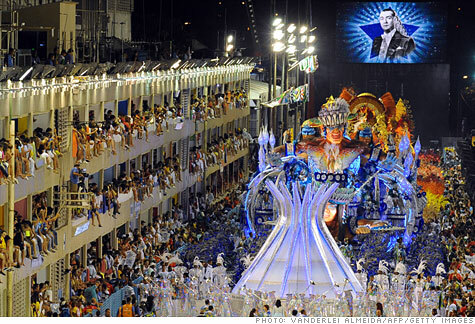 "When the bull market ends, will Brazil resort to dictatorships, coups or printing money? Now is the time to open up," says Jim Rogers, co-founder of the Quantum Fund. For sustainable growth, Brazil needs a more nimble economy and small business incentives encouraging long-term investment in factories, plants and roads. "It's important to avoid investors selling as the Rio Olympics begin," says Matthew Cole, a partner at the private equity firm North Bay Equity. "Standing still is not enough. Brazil needs a long term view." To be sure, Brazil's stratospheric rise is overdue and well deserved. The country is laden with natural resources and many promising consumer plays today. It also boasts heady offshore oil finds and national champions like meatpacker JBS which gobbled US icon Swift in 2007. Brazil's young population assures a big future labor force (and buying class). But that may not be enough to weather slower economic growth. Though the carnival spirit has been merited in recent years, the post-party mop-up, as much of the world has learned, isn't always pretty. Should investors be worried about China?